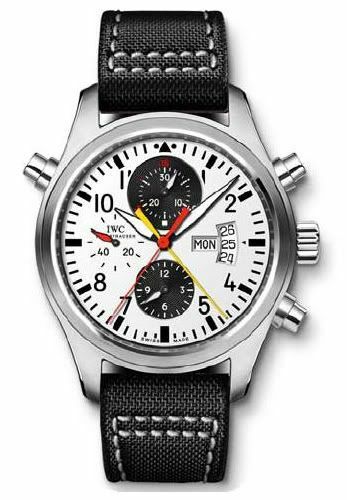 I just returned from Munich (Germany) and I noticed in some magazine that IWC gave a number of Limited Edition Doppelchronographs to the German national soccer team just before the The 2008 UEFA European Football Championship kicks off on the 7th of June. This watch is limited to 500 pieces. The first 24 pieces will be given to the players and trainer of the German league. The Doppelchronograph (ref. 3718.003) has a diameter of 44mm, a height of 16.2mm and features IWC caliber 79230 which is based on the famous ETA/Valjoux 7750 movement. The case is stainless steel and on top is a domed sapphire crystal. Inside the watch is a soft iron core to protect the movement from magnetism. The watch comes on a nylon strap. Estimated price is 8900 euro.